The Caps got goals from Mike Eagles, Mark Tinordi, Stefan Ustorf, and the game-winner from Dale Hunter on a power play. Jim Carey was the winning goaltender, stopping 24 of 27 shots. The lineup also included Jason Allison, Martin Gendron, Jim Johnson, Pat Peake, and Keith Jones (yes, that Keith Jones). The lineup did not include either Peter Bondra or Michal Pivonka, holdouts that were still in contract negotiations with the club as the 1995-1996 season started. Jim Schoenfeld was head coach. Brendan Witt was a rookie. Sergei Gonchar and Ken Klee were in their first full seasons with the club. Andre Burakovsky was eight months old. It is the only win in regulation time the Caps have in Dallas. As for the 2016-2017 version of the Dallas Stars, things are going slowly of late. Dallas is 3-6-1 in their last ten games, the last seven of which have been a wild roller coaster ride, scoring four or more goals four times (3-1-0) and scoring one or none three times (0-3-0). In their ten-game skid, Patrick Eaves and John Klingberg lead the club in goals with four apiece. Klingberg has quietly become one of the top offensive defensemen in the league. Over the three seasons he has been in the league, he is one of a group of 13 defensemen with at least 25 goals and at least 120 points. That is a group that includes Brent Burns, Oliver Ekman-Larsson, Shea Weber, Kris Letang, P.K. Subban, and Erik Karlsson. You know…the biggies. This season, he is right there again, tied for 11th in goals among defensemen (7) and tied for 13th in points (26). Oddly, perhaps, his offensive contributions do not track well with team success. Dallas is 3-2-1 in the six games games he recorded goals and 8-8-5 in the 21 games he registered points. Klingberg is 0-4-4, plus-1, in three career games against the Caps. For Eaves, Dallas is his fifth stop in a 12-year career. This is his third season in Big D, and he already has his second-best goal total for a season (16), topped only by the 20 goals he scored as a rookie with the Ottawa Senators in 2005-2006. His 27 points in 46 games puts him on a pace (48) that would comfortably eclipse his personal best, 32 points with Ottawa in 2006-2007. What he might also carry out of this season is his career worst in plus-minus. At the moment, he already has that (minus-11), surpassing the minus-7 he recorded playing with Detroit and Nashville in 2013-2014. Dallas is 8-4-3 when he scores a goal, 11-6-4 when he records a point. Eaves is 4-4-8, even, in 23 career games against Washington. The goaltending for Dallas has been quite unremarkable, unless your remarks tend to the profane. In the recent 3-6-1 stretch, the Stars used two goalies in five of the games. Overall, Antti Niemi and Kari Lehtonen have a combined goals against average of 3.38 and a save percentage of .896 over the ten games. Individually, Lehtonen has been a bit better, with a 3.05 goals against average and a .905 save percentage. Unfortunately for him, he has no wins to show for it in this stretch (0-3-1). Niemi has a 3.89 GAA and a .884 save percentage and is 3-3-0. Lehtonen is 17-6-2, 2.58, .922, with two shutouts in 25 career games against Washington, while Niemi is 5-0-3, 2.52, .912, with one shutout in eight career appearances against the Caps. 1. If the Caps are going to get well on the power play, this is the team against which to do it. Over their last ten games, the Stars allowed power play goals in eight games (multiple power play goals five times) and are 23-for-36 overall (63.9 percent). On the other hand, the Stars do have the 11th-ranked home penalty kill (83.6 percent). 2. When on the power play, no team has allowed more shorthanded goals than the Stars (eight, tied with Philadelphia). 3. Only three teams have committed more penalties overall than the Stars (211). All of them are in the Western Conference (Calgary: 234; Anaheim: 217; and Winnipeg: 212). The Stars are second in the league in fighting majors (21), trailing only Anaheim (28). 4. If the Stars are trailing after two periods, a loss has been automatic. Dallas is one of two teams that have not yet won a game when trailing after 40 minutes. They are 0-16-2; the New York Islanders are 0-11-1. 5. Dallas is not a strong possession team on home ice. They rank 23rd in Corsi-for at 5-on-5 (49.22 percent), although they do rank 17th in that statistic corrected for score, zone, and venue (49.93 percent; numbers from Corsica.hockey). 1. In their first 34 games, the Caps scored five or more goals twice, in a 5-2 win over the Canucks in Vancouver back on October 29th and a 7-1 win against Pittsburgh on November 16th. In their last 11 games the Caps scored five or more goals eight times. That makes ten such games this season. Don’t go thinking they’re on their way to setting a record. They did it 34 times in 1991-1992, and in the post 2004-2005 lockout era their high is 26 times in 2009-2010. 2. Washington is the only team in the league with four players having at least 15 goals: Alex Ovechkin (21), T.J. Oshie (16), Justin Williams (16) and Marcus Johansson (15). 3. The Caps have not allowed a first period goal in their last eight games. No, not even in that 8-7 fun house game against Pittsburgh. Toronto was the last club to do it, back on January 3rd. 4. There is even strength, and there is 5-on-5. Don’t confuse them. The Caps are tied with the New York Rangers for the most goals scored at 5-on-5 this season (105). However, Washington is one of seven teams that has not yet scored a 4-on-4 goal this season. 5. The Caps have more wins when scoring first (25) than any team in the league and have the league’s second-best winning percentage (.781/25-3-4) when doing so, trailing only Ottawa (.789/15-3-1). He is not quite the grand old man of the Lone Star State, but Jason Spezza has a lot of miles on him. It seems just yesterday that he was the second overall draft pick of the 2001 entry draft, taken by the Ottawa Senators. Now, 883 games later, he is entering the autumn of his career at age 33, the fourth-oldest player on the Stars’ roster of skaters. This season, while Spezza is tied for third on the club in total scoring (27 points, with Patrick Eaves), he is far from the production of his heyday. His seven goals in 40 games is his lowest goals-per-game output (0.18) of his career. His points-per-game (0.64) is the second-lowest of his career, surpassed only by his first season in the league in 2002-2003 (0.68). Although he has points in nine of his last 14 games (12 points overall), Spezza does not have a goal in his last 11 contests. He has had his success against the Caps, though, going 12-22-34, plus-1, in 35 career games against Washington. Including that January 11th win over the Penguins, the Caps are 4-0-1. Ovechkin does have six assists since those two goals against the Penguins, but clearly, at least for the moment, it’s not all about how Ovechkin produces in terms of goal scoring. Nor is it how much ice time he gets. Only once in the last 21 games has he skated more than 20 minutes (he did have a 20:00 night against the Islanders on December 27th), and in those 20 games in which he did not pass 20 minutes, the Caps are 16-2-3. Ovechkin is, for the time being, less a solo performer and more a “headliner” who generates interest from opponents (such as cheating to his side on power plays), allowing the ensemble to shine. There are fans who might be nostalgic for Ovechkin’s 50-goal seasons, but that seems less and less a likelihood this season (he is on a pace for 38 goals) just as the club seems to be establishing its depth and consistency up and down the roster. Ovechkin is 7-3-10, minus-2, in 12 career games against Dallas. 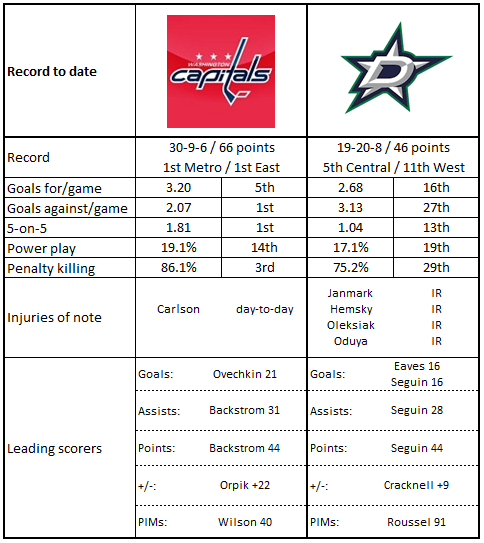 Dallas is known as “Big D.” For the Capitals, “D” has been synonymous with “despair” in their meetings against the Stars in Texas. This is not the best of Dallas teams, though. They can muster a lot of offense, but their defense and special teams, particularly on the penalty kill, leave much to be desired. One would think that a club having as much success as the Caps on offense recently (54 goals in their last 11 games) would be able to exploit the defense and goaltending deficiencies of this club and exorcise the demons that have tormented them in this city.